My daughter has been playing softball and baseball for a while. She is a determined and fierce little competitor. For a long time she has had a bit of a mental block with hitting the ball. She is perfectly capable of hitting the ball. Her stance is strong. Her swing is terrifying. She has every ability to smack the ball out of the park. But for an entire season she didn’t get one hit. Coming into another season I was debating how to be there for her. I don’t want to helicopter over her struggle. I don’t want to take over as her coach. I’d rather let her be free of one more person giving her constant advice. But I also didn’t want to say nothing, because I really care about her. Finally something came to me so I left her the note in a journal that we keep with one another. She got a hit that day—not because of magic words but maybe, maybe because she believed in herself. I need to believe in myself too. I believe in what I am supposed to do and in what my life is about. I believe in my Daughterhood as a child of God. I believe I am good at things. I believe in my gifts. I believe in my abilities. I believe in who I am made to be. But sometimes, a lot of the time, I believe in something else more. I believe that someone else is better. I believe in a better timing than now. I believe that someone else’s gifts are better. I believe failure is more likely. I believe it will just all be too hard for me. I believe my steps aren’t right and my choices aren’t good. I believe that what I’m creating is actually not interesting to anyone anymore. Sometimes it’s not enough to believe in something. You have to believe in something more than something else. Why do we tend to believe in our lies more than our truths? Why do we believe in tomorrow more than today? Why do we believe more in someone else’s purpose than our own? Why do we believe more in God’s work in someone else’s life rather than in God’s heart for our own life? Many of us live this way. When we don’t recognize that our beliefs have been completely overshadowed by a stronger set of beliefs, we end up living defeated. So we have to be conscious of which beliefs are winning. The believing-morereally matters. It adds up. I have believed that I was a good writer, but then I believed-more that there were too many great people out there, so I never submitted. I have believed that I could get the job, but I believed-more that it would be over my head, so I never applied. I have believed that I should speak up and say something important, but I believed-more that it wouldn’t matter, so I never said anything. I have believed that people loved me, but I believed-more that they had forgotten about me so I hid away. I believed that God loved me no matter what, yet I have believed-more at times that my wrongs were too great so I withdrew. I’m realizing I can say I believe something about myself or God or my life and yet it can be totally void of power in me. But as I pay attention to this, I believe that I can do something about it. Moment by moment, I can pick up the beliefs I’m really interested in living by and choose to believe them more than the rest. Over the last year a vision has been forming in my heart for a creatives gathering for women. As the idea grew over time, I got more and more excited about it. I felt sure that God had placed a passion in me to bring women from all backgrounds together to celebrate one another’s creative expressions and artistic giftings. I firmly believed that the group would be very special and that the idea was not to be dismissed. Then I began to believe other things. I began to believe that I couldn’t carry it out. I began to believe that I wasn’t the right person to lead it. I believed I didn’t have what it took to draw women in and make it happen. To be extremely honest, even ridiculous beliefs consumed me, like thinking I didn’t have a good couch for them to sit on. Did I believe the idea was special? Yes! Did I almost throw the entire thing out the window because of the negative beliefs that I was believing more? Sadly, yes! But, thank God I received a number of strong encouragements from friends and the Holy Spirit alike that affirmed my decision to move forward. I decided to carry out the vision. I planned the event, put out the invitation, and ultimately enjoyed hosting and facilitating one of the most beautifully inspiring events I have ever attended in my entire life. On this side of the event, I cannot believe I ever considered ditching the idea. Strangers met. Laughter rose up. Voices were heard. Hearts were pierced. All the women held each other’s creativity with a fierce enjoyment. My heart is still so stunned with awe. And in truth, the event only happened because I believed more. 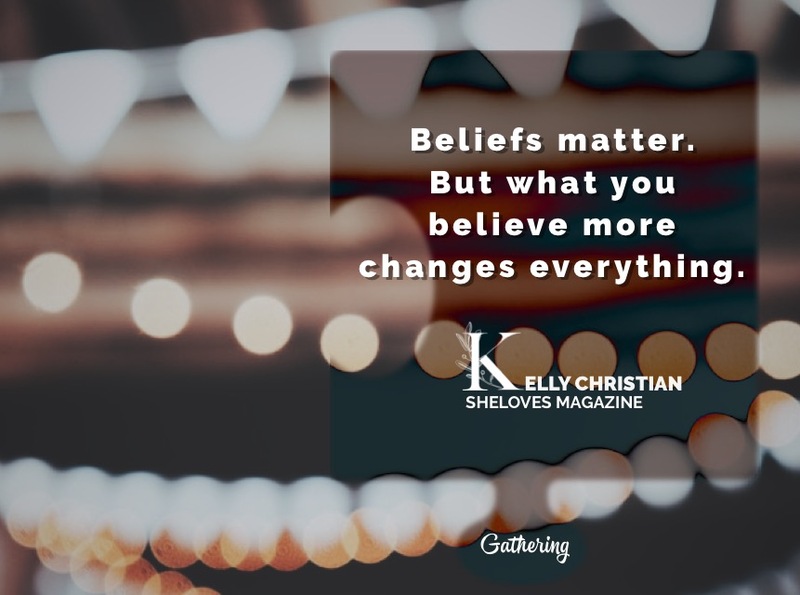 Beliefs matter. But what you believe more changes everything. Kelly Christian is ever reckoning life, always wishful for the next chance to put everything that means anything into type. Her heart is riveted by faith, questions, beauty, creation, identity, and sparks in conversations with strangers and friends alike. Kelly is currently working on a nonfiction book about letting loose of reputation in order to find one’s identity. 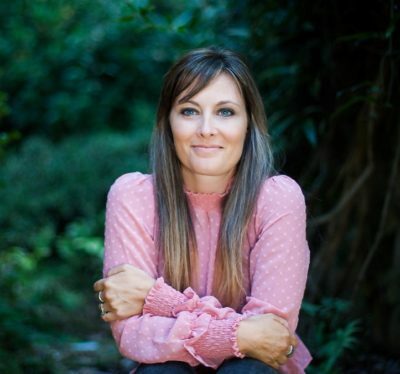 Kelly resides in Charlotte, North Carolina where she writes nonfiction, teaches English as a second language, and enjoys loving on her four little dignified souls alongside her husband.